The next morning, 28th August, was fine and sunny. Ration parties despatched to a rendezvous on the main road to carry back boxes of compo were heartened to see a steady stream of infantry and armour moving forward along the original axis. Some of Worcestershire casualties had lain out on the hill-side during the night in no-man’s land. They were now quickly brought in and attended to, though some of them had already had their wounds dressed by the enemy before they pulled out. Lieut. 'Benny' Goodman recalls: “When I arrived at 214 Brigade Tac H.Q. just short of the Seine, the guns of all three Field Regiments - 94, 112 & 179 were firing in harness - a deafening row. Then ahead of me an artillery spotter plane was shot down by enemy gun fire over the Seine. I was welcomed by the Brigade Staff Captain John Denison (later to be DAA & QMG and later in civilian life Administrator at the Festival Hall in London) who said ‘You have come to the wrong place. You should have gone to ‘B’ echelon.’ At the time the 1st Battalion Worcestershire Regiment were still under command of 129 Brigade for the four Battalion crossing of the Seine. I then had to wait until Brigadier Essame returned to find out what I had to do next. 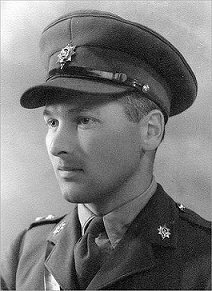 About half an hour later the Brigadier together with a liaison officer drew up in a scout car back from the scene of battle. They were covered from top to toe in dust and mud. This was my first meeting with the Brigadier. He was a trifle angry. Why? Because one of his battalions, the 1st Worcestershire, had been taken from him for the crossing and placed under the command of 129 Brigade. True it was just about to come back again, but the rivalry between the two brigadiers was all too clear. When I arrived at the other side of the bridge to my joy I saw a Worcestershire Cap Badge – Sergt. Jim Norton - who warmly greeted me. I then moved further up the road to the Worcesters who I found exactly as I had expected, and in the process met Major ‘Doc’ Watson and Captain Wally Leadbeater. I then went off to find the 7th Somersets. This turned out to be a quite different story. The map was excellent but as I drove further and further into the woods still no sign. Only later did it emerge the Somersets had advanced far too far, one company had been surrounded and captured, including one young officer who only days earlier had travelled with me from Southampton. The woods were thick and silent. I was alone; I was a sitting target for any German sniper hidden in the undergrowth. Was I frightened? I was petrified. I then heard the sound of tanks - I hurled the motor cycle into the vegetation .... and waited. It was around this time that Lieut. 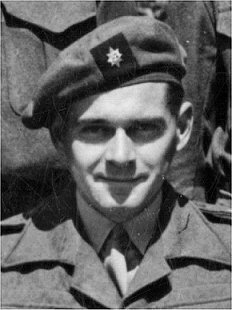 H. H. H. ‘Jimmy’ James injured his leg after falling during enemy mortar fire. Lieut. 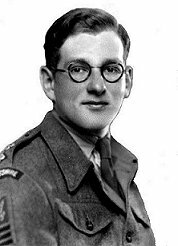 Benny Goodman was to replace him as the Worcestershire liaison officer with 214 Bridage and take on his batman Arthur Tolley. Note: Lieut. Benny Goodman later became Camp Commandant at 214 Brigade HQ. It was at Brigade HQ that he was first called Benny (after the famous Jazz Band Leader) - a nickname that stuck with him throughout his army career. 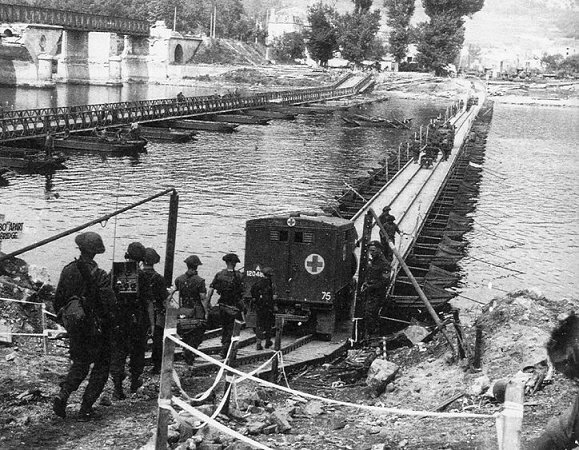 At mid day on the 28th August 1944 the 1st Battalion Worcestershire Regiment received orders to proceed back to the bank of the river and relieve 5th D.C.L.I. in the village of Pressagny L’Orgueilleux. The relief was completed by 15.00 hours. The Cornwalls, who had held a determined counter-attack on the village the previous night, were sunning themselves and preparing for an attack that afternoon on another village to the north-east called Panilleuse.